NEW ORLEANS — The New Orleans Pelicans (28-25) have lost four of five games since losing center DeMarcus Cousins to a season-ending Achilles tendon injury, and when they host the Indiana Pacers (30-25) Wednesday night at the Smoothie King Center, coach Alvin Gentry hopes they will feel a sense of desperation. Since Cousins went down on Jan. 26, the Pelicans have slipped to the eighth playoff spot in the Western Conference, just a half-game ahead of the ninth-place Los Angeles Clippers. Gentry told his players after practice on Tuesday that they must play with a greater sense of urgency, even while they are getting familiar with recently acquired forward Nikola Mirotic. Mirotic will be playing his third game for the Pelicans since coming over in the trade with the Chicago Bulls. Mirotic had a double-double in his Pelicans’ debut (18 points and 12 rebounds) against Minnesota, but he scored just five points on 2-of-8 shooting, including 0-of-4 from long range, in a 133-109 home loss Monday night to the surging Utah Jazz. Mirotic said it may take him two more games to become more comfortable with the Pelicans’ offensive scheme, but he’s confident in his ability to give Anthony Davis some needed help from the perimeter and on the boards. “I feel good,” Mirotic said. “I’ve been playing this game a lot and performing, so I’ve always felt that kind of pressure. I know I cannot do what DeMarcus was doing, but there’s a lot of stuff I can bring to this team, and that’s why I’m here. Davis said no one is panicking despite Cousins’ absence. 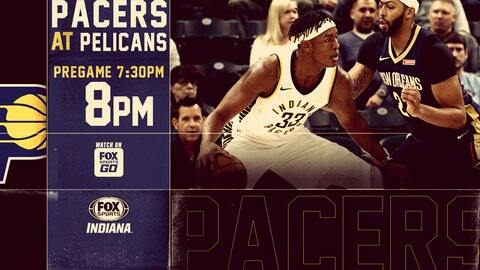 The Pacers have beaten the Pelicans in 12 of their last 15 meetings, although New Orleans snapped that string on Nov. 7 with a 117-112 road victory in which Davis scored 37 points and grabbed 14 rebounds. However, in that game, Cousins went for 32 points and 13 rebounds, and now he’s missing in action. The Pacers lost 111-102 to the Washington Wizards on Monday but played without Victor Oladipo, who missed the game with an undisclosed illness and is questionable for Wednesday night’s game. Guard Darren Collison underwent arthroscopic left knee surgery on Tuesday after sustaining the injury against Philadelphia on Feb. 3. Collison is expected to miss two to three weeks. The Pacers are 0-6 when playing without Oladipo this season and have been outscored by an average of 12 points in those losses.